Are you looking for some of the best remote desktop software for windows and mac based computers? Well, if the answer is yes I,m here to help you out. As you already know a remote control software lets you access a computer from another. You can not deny the fact that a Remote desktop control software is quite helpful in many cases. For example, you can use remote access softwares for fixing the issues on PC, Website outside your home, city, and even outside countries. There is no limit in the distance while using a remote access software, with a remote desktop software, you will easily be able to fix different computers issues. However, it gets quite hard to choose the best remote desktop software. As there are too many options available on the internet. Just in case if you are too confused about what software to pick then read on. In this article, we will be sharing some of the top remote desktop software for Mac and Windows based computers. You might be also interested in using the Best VPN Softwares For Windows & MAC 2018 While using remote desktop access software on your computer. Whenever it comes to a Remote desktop access software Team viewer is the common name that people take. As the software is super easy to use and available for free on the internet. With the help of the application, you will not just be able to access a computer remotely but you will also be able to chat with your friend. It helps you to describe your issue over the remote access. You can also talk to each other using a microphone. The software is available on most of the platforms, including Windows, Mac, Ubuntu, Android and so on. Just in case, if you want to download the app then you can visit the official website and you will get the download link. If you do not want to install an application on your computer then you can try out the Any Desk application. It is a small file that you can carry anywhere using a pen drive. The steps in order to use the application are also super easy. Just double-click on the file and you are good to go. Also, there is a free and paid application available for the Any desk app. However, you will not get any feature to chat. Also, the free version comes with a few restrictions but still it does the job. The application is available on almost all the popular platforms including Windows and Mac. Just in case if you don’t want to install any third party app. Then you can try out the Chrome Remote Desktop. Well, the Chrome Remote Desktop is not a software that you have to download. Instead, it is a chrome extension and the best part is you can use it for free. In order to use the Chrome Remote Desktop all you will need is the Google Chrome browser. If you have the browser then go to the chrome web store and search for the Chrome Remote Desktop and install it. Once installed you are all set to share your screens. Up next we have handpicked the Wayk Now. It is also one of the lightweight remote desktop software. The software is freely available for download, However, if you want access to all the features then you need to opt-in for their paid plan. Talking about the features, the application offers remote control, file transfer, clipboard sharing and so on. You can consider the application as one of the remote desktop software for Windows and Mac. You can also use the application on your android computer so make sure you are checking it out. If you are looking for a premium Remote desktop access software. Then you should surely check out the Connectwise Control. Earlier the application was used to known as the Screen Connect. However, the name is changed now. Additionally, apart from the premium tools, there is a free plan as well. You can download the connectwise control application on all the major platforms that includes Mac and Windows. So consider having a look at this for sure. Go to my pc is one of the coolest remote Remote desktop access software. The thing about this remote desktop client is that you do not need to download any application. All you will need is a computer browser and an account on the GoToMyPC. Also, it is supported on all the platforms as you do not need to download any software. However, the service is not free, although they offer a trial period. So if you are interested in their service then you can consider trying out the trial. Up next we have the log me in. The application is perfect for personal and cooperates use. It allows you to remotely access a computer and share files. However, the service is not free and is available on all the major platforms. Including Mac and Windows. 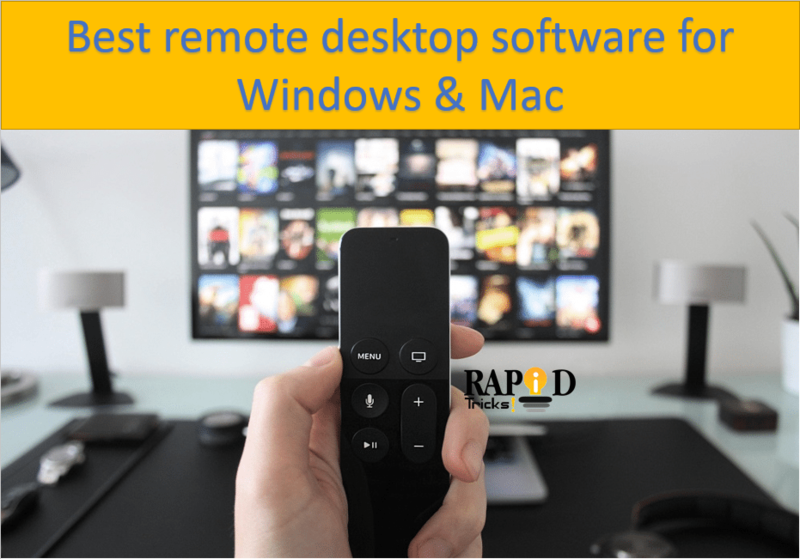 You can also consider log me in as one of the best remote desktop software for Mac. At the end, we have the Cord. Well, it is one of the best remote desktop software for Mac based computers. The application is free to use also it works with Windows really smoothly. You will get the cord application available on the apple store or you can download it by visiting the official website. Also if you are looking for a free yet reliable remote desktop software then you should definitely try this out. So that was all for the best remote desktop software for Windows and Mac based computers. Also if you are looking for a Remote access software for personal use then a free software would work. However, if you want a Remote desktop control software for business use then consider taking a paid plan. If you have any questions then you can comment below.